Be manly. Don’t ever let the world think you’re weak, and certainly not that you’re gay. Or that’ll ruin everything. That was the advice my dear old dad always gave me before he passed away, leaving me in charge of Reed Enterprises. His words have served me well up until this day: I’m one of the richest and youngest CEOs in the country. I work hard and play hard—in secret. After a long day of work, I go home with men my assistant procures for me. They’re attractive, they let me dominate them, and they sign a Non-Disclosure Agreement so that no one knows my dirty little secrets. But it’s only once I meet Tyler Lewis by happenstance on the street outside my office building that I realize these one-night trysts can’t give me what I truly desire and have never had– true love and acceptance. He seems familiar, and I fear my strong drive to be near him, but I can’t seem to resist the pull. Will my dad be right and my whole world come crashing down if I break my own rules and see him again? I listened to him, bulking up my scrawny frame and joining the military. I acted every bit of a strong manly man but now I’m back in Madison trying to get my music career to take off– or at least trying to get a job— and I’m not happy without seeing Duncan again. I often walk by his fancy office building when I’m out looking for gigs. One of these days, I’m going to go inside and confront him. I know he’s a hotshot CEO who takes charge in the bedroom like he does in the boardroom. But now it’s time he listens to me and lets me call the shots. It’s time he gets down on his knees and makes up for pushing me away long ago. But is he capable of being true to himself and letting me fulfill the wildest desires of his heart and body? Or will he hurt me again like he did back then? 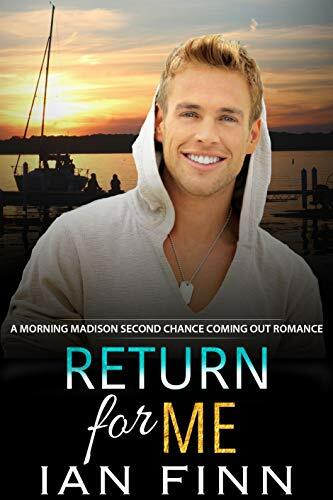 Return for Me is a second chance, coming out/ out for you, opposites attract, rags to riches, male/male romance. It mixes hot dom/sub action of man-on-man parts in the bedroom with sweet voice/note action of man-on-man musical numbers on stage. It has lots of steam, no cheating, no cliffhangers and a very happy ever after. It’s a standalone full length, 53,000 word novel in the Morning Madison series, which can be read in any order but are best enjoyed together, and with a big glass of water nearby due to so much heat in addition to all those feels!